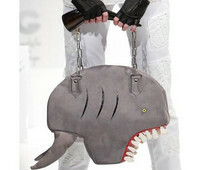 runaway love: TFW S/S12 Day 5: Cydelic by Choryin - little purse creatures! TFW S/S12 Day 5: Cydelic by Choryin - little purse creatures! 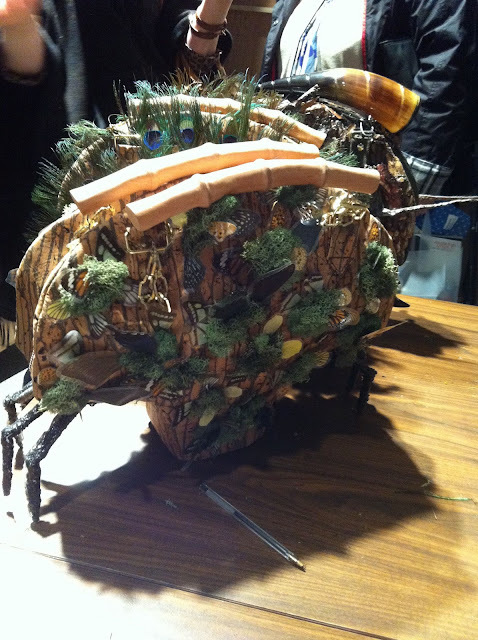 Day 5 - the big finale of Toronto Fashion Week and one of the most exciting nights (in my opinion). The FDCC definitely tried to save the best for last. I can't say whether or not it was the best night of Fashion Week because I couldn't make it to all the shows, but the one thing I can say is that it was definitely the most artsy and creative. When I started my shift the Cydelic by Choryin studio runway show had just ended. I managed to run back stage, pretend to have been one of the dressers, and snap a few photos of the collection's amazing bags. They were literally pieces of art. 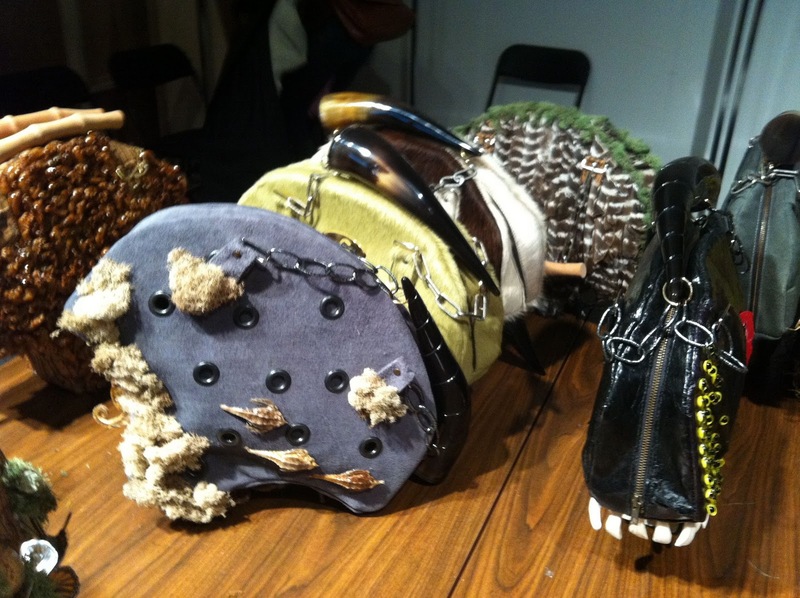 Each purse had the same seashell-like shape but were all decorated differently- making each one incredibly unique. 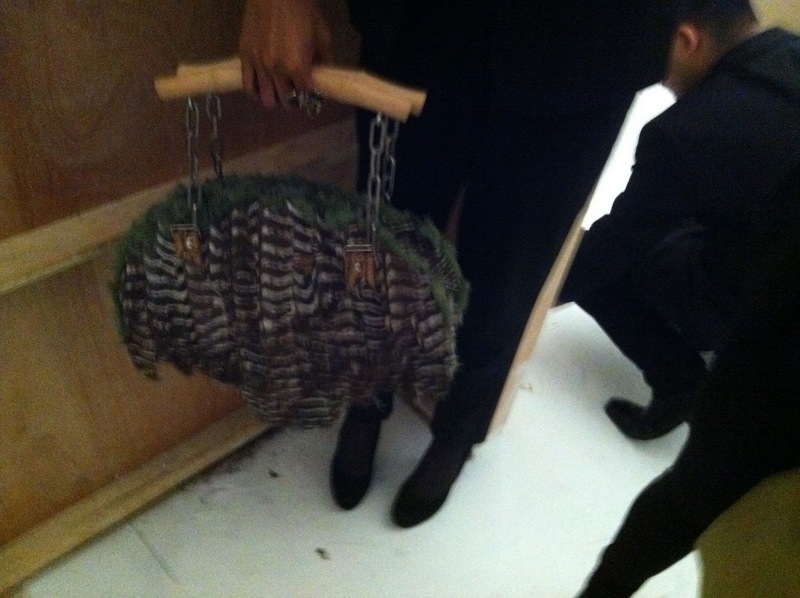 The purses were exploding with crazy things like shells, huge feathers, rocks, colour animal hides, patent leather, tree bark, etc. 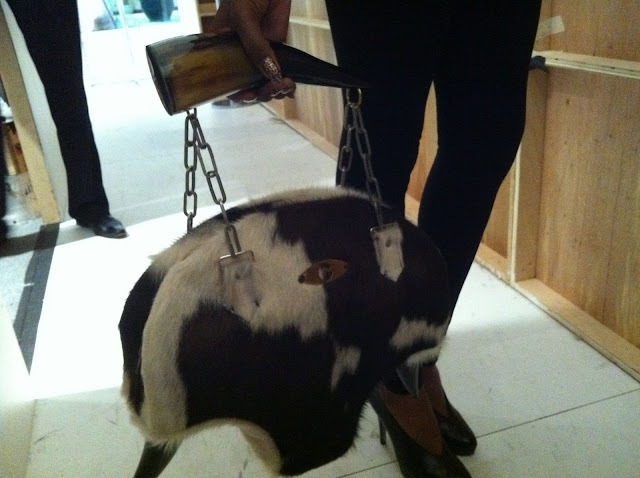 They all had these really great chain straps with either; a horn, or stick of bamboo, as a handle. Some of the purses looked like little Japanese cartoons! 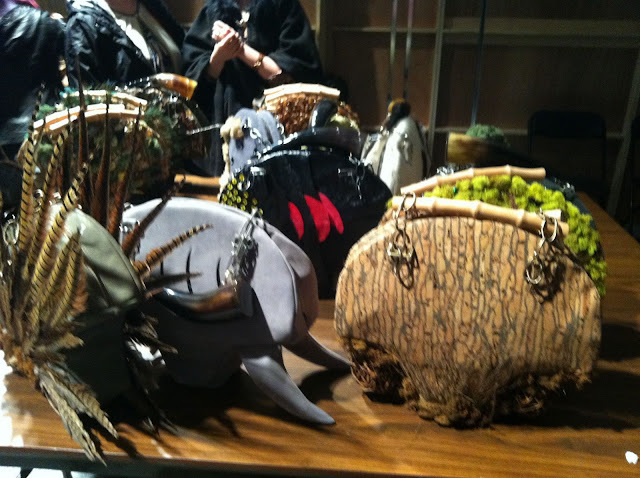 My favourite one was the little whale bag. It looked like something you would find at a Hello Kitty store or on one of Gwen Stefani's Harajuku girls. The clothes were also really creative and somewhat futuristic looking. I didn't actually get to see them on the runway but I did get a chance to quickly look through the rack as the assistants were packing up. Choryin showed a lot of whiteish pieces with large protruding plastic angles (shoulders, hips, etc). I just looked up the title of the show... and you will never guess what it was...Alien. How fitting. Phew! I totally get it now. Ha!